In the continuing fight for the greater availability of public information, it may seem churlish to observe that sometimes what’s wanted is not more information, but less. The picture above shows a typical display on a Countdown sign at a London bus stop. This particular stop has buses from two routes. At a quick glance, you might be forgiven for thinking that it’s going to be a long wait for a 2, while three 88s roll past ahead of it. Actually, the sign shows no such thing: the bottom three lines cycle through all the buses known to the system, so the second, third and fourth aren’t showing. Nor indeed are the eighth and ninth, which at that moment were 20 and 23 minutes away respectively. But if you want to know when the next 2 is due, you will have to wait for the sign to cycle round. I would be prepared to lay considerable odds that there is not a single person standing at that bus stop who has the slightest interest in the fact that a 2 will be along in 16 minutes, still less (if that were possible) that there will be another one in 20 minutes. What they care about is that the next one is three minutes away, and right now the sign isn’t telling them that. 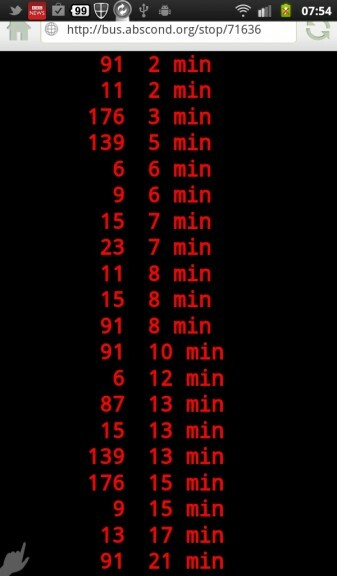 In extreme cases, there are so many buses stacked up in the queue that they come and go faster than the display can keep up with them – the screenshot on the right (from James Darling’s minimalist site) is from the bus stop with the most extreme case of that problem I have come across. There are no imaginable circumstances when it would be useful to know that that the sixth bus to Marylebone is coming in 26 minutes, when you are already standing at the bus stop. But there is potentially much greater value in that information when you are not at the bus stop at all. So for Countdown at bus stops, perhaps the solution is simply to show less. The first and second bus due for each route served by the stop might do it (though capping by either time or an arbitrary number of buses shown wouldn’t). But the moment you are not at a bus stop, the ideal solution changes radically, for two reasons. The first is that the information is now informing a different decision: whether now is a good time to be going to the bus stop in the first place, with opportunities for trade offs which exist only because the information has been liberated from the bus stop. The second is that the small screen in my pocket can comfortably show me the next twenty buses; the much bigger screen attached to the bus stop struggles as soon as there are more than four. The point of this is one which at one level should be trivially self-evident: what counts as good information depends on the question you want to answer or the problem you want to solve, and more information may not be better information. But since there are many different questions and problems, it would be folly to think that there is a single best way of selecting and presenting the information. Part of the power of open data is that it creates the possibility for highly specialised solutions – as Adrian Short has both elegantly argued and practically demonstrated. James Darling’s account of why he built his version and what he and others have done with it is also well worth reading. But enough. I have a bus to catch. I had hesitated to write this post at all – there is only so much bus stop nerdery any self-respecting blog should contain, and I am already well over quota for this year. But I took heart from Paul Annett’s meticulous deconstruction of a bus stop indicator at Heathrow, so here it is.